Exposure therapy is a technique in behavior therapy intended to treat anxiety disorders and involves the exposure to the feared object or context without any danger in order to overcome their anxiety. Procedurally it is similar to the fear extinction paradigm in rodent work. Numerous studies have demonstrated its effectiveness in the treatment of anxiety disorders such as PTSD and specific phobias. Exposure-based therapy may be effective in preventing the progression from acute stress disorder to post-traumatic stress disorder, according to a report in the June 2008 issue of Archives of General Psychiatry. It is also very closely related to exposure and response prevention, a method widely used for the treatment of obsessive-compulsive disorder. The use of exposure as a mode of therapy began in the 1950's during the behavior therapy movement, a time when the psychoanalytic view dominated Western psychology and behavioral therapists first emerged. South African psychologists and psychiatrists, who brought their methods to England and the Maudsley Hospital training program, first used exposure as a mode of therapy to reduce pathological fears, such as phobias and anxiety-related problems. One of the first psychologists to spark interest in resolving clinical problems from a behavioral point of view, Joseph Wolpe (1915-1997) sought consultation with other behavioral psychologists similar in methodology. James G. Taylor (1897-1973), working in the psychology department of the University of Cape Town in South Africa, was among the psychologists Wolpe sought discussion with. Although most of his work went unpublished, Taylor was the first recorded psychologist to use an exposure therapy treatment for anxiety, including methods of situational exposure with response prevention - a common exposure therapy technique still being utilized. Since the 1950's and the behavior therapy movement, several modes of exposure therapy have proliferated, including systematic desensitization, flooding, implosive therapy, prolonged exposure therapy, in vivo exposure therapy, and imaginal exposure therapy. Exposure therapy is based on the principles of respondent conditioning often termed Pavlovian extinction. The exposure therapist identifies the cognitions, emotions and physiological arousal that accompany a fear-inducing stimulus, and attempts to break the pattern of escape that strengthens the fear response, through measured exposure to progressively stronger stimuli until habituation is reached. The technique involves the creation of a program of steadily escalating steps or challenges (a hierarchy), which can be explicit ("static") or implicit ("dynamic" - see Method of Factors), that work towards a final goal representing a "non-phobic" response. The patient then voluntarily moves through the steps, with a means of terminating each step which is under voluntary control. While therapeutic exposure has a strong evidence base, many clinicians are uncomfortable performing the technique because they do not understand it or are not confident in their own ability to utilize it. This has prevented many who could benefit from this form of therapy from receiving it. Exposure and flooding differ in that flooding starts at the most extreme item in a fear hierarchy, while exposure does not. There is profuse evidence that exposure therapy is an effective treatment for people with generalized anxiety disorder, citing specifically in vivo exposure therapy, which has greater effectiveness than imaginal exposure in regards to generalized anxiety disorder. The aim of in vivo exposure treatment is to promote emotional regulation using systematic and controlled therapeutic exposure to traumatic stimuli. Exposure based therapies have also been found to be successful in treating specific phobias and are the most validated treatment known for phobias. Several published meta-analyses observed the success of a single-session of exposure therapy - specifically imaginal exposure, a one to three hour treatment session - in treating patients with specific phobias. Four years later at the post-treatment follow-up, 90% of patients retained a considerable reduction in fear, avoidance, and overall level of impairment, while 65% no longer experienced any symptoms of a specific phobia. A type of exposure therapy has recently found efficacy in treating disorders extending further into the anxiety spectrum. Virtual reality exposure (VRE) therapy is a modern but effective treatment of posttraumatic stress disorder (PTSD), and has been tested on several active duty Army soldiers using an immersive computer simulation of military settings over six sessions. Self-reported PTSD symptoms of the active duty Army soldiers were greatly diminished compared to pretreatment reports, thus advocating exposure therapy's effectiveness in reducing PTSD. Exposure therapy has shown promise in the treatment of co-morbid PTSD and substance abuse. Exposure therapy is a behavior therapy technique. Many organizations exist for behavior therapists around the world. 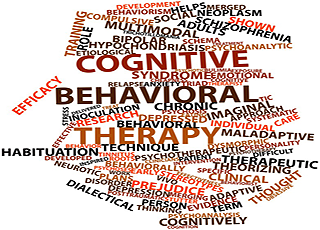 The World Association for Behavior Analysis offers a certification in behavior therapy. This certification allows for the demonstration of knowledge regarding exposure therapy. Look up Exposure therapy in Wiktionary, the free dictionary. Please browse our fully updated library of professionally produced Hypnosis Downloads and Hypnosis Scripts for advanced self hypnosis audio mp3s and indirect hypnotherapy scripts relating to: exposure therapy, exposure therapy definition, behavior therapy, behavioural therapy, cognitive-behavioral psychotherapy techniques, conjunction, gain control, imagery exercises, life stressors, overcome fears and phobias, ptsd therapy, therapy for anxiety disorders, treatment of post-traumatic stress disorder, what is exposure therapy. Please browse our Hypnosis Online Store for books, cds, downloads, dvds, ebooks, mp3s, scripts, and videos relating to: exposure therapy, exposure therapy definition, behavior therapy, behavioural therapy, cognitive-behavioral psychotherapy techniques, conjunction, gain control, imagery exercises, life stressors, overcome fears and phobias, ptsd therapy, therapy for anxiety disorders, treatment of post-traumatic stress disorder, what is exposure therapy. Please visit Hypnotic-world.co.uk for advanced self hypnosis audio mp3s, hypnosis courses, and hypnosis pdf relating to: exposure therapy, exposure therapy definition, behavior therapy, behavioural therapy, cognitive-behavioral psychotherapy techniques, conjunction, gain control, imagery exercises, life stressors, overcome fears and phobias, ptsd therapy, therapy for anxiety disorders, treatment of post-traumatic stress disorder, what is exposure therapy. Please visit Hypnotic-world.com for more information relating to: exposure therapy, exposure therapy definition, behavior therapy, behavioural therapy, cognitive-behavioral psychotherapy techniques, conjunction, gain control, imagery exercises, life stressors, overcome fears and phobias, ptsd therapy, therapy for anxiety disorders, treatment of post-traumatic stress disorder, what is exposure therapy.